Two days before Star Wars: The Last Jedi hits theaters, you can play with some of its characters, locations, and vehicles in Star Wars Battlefront 2. EA and DICE announced today that they will kick off "The Last Jedi Season" - the first of many planned update events - on December 5, headlined by the addition of Finn and Captain Phasma as playable heroes a week later. You won't be left out if you're more of a single-player fan, either. A new chapter in the single-player campaign called Star Wars Battlefront 2 Resurrection will arrive on December 13. EA says Resurrection will follow Imperial special forces soldier Iden Versio "during the days of the First Order's rise to power". The main campaign fills in some of the decades-long gap between Return of the Jedi and The Force Awakens, so it sounds like this will take place on the latter end of that. It's always fun revisiting action movie type characters when they're older, wiser, and improbably still alive. The festivities will actually begin a week before that on December 5, when players will be given the chance to choose one Faction to fight for throughout the first Star Wars Battlefront 2's first season: Resistance or First Order, duh. You can then contribute to your faction's victory by participating in special challenges and earn rewards (the first of which will be a loot crate full of upgrades for either Finn or Phasma). Here's the full schedule, as laid out by EA. I'll also write it up below because, let's be real, that text is super small. Dec. 5: Choose your faction (First Order or Resistance) and participate in the first Weekly Faction Challenge. Dec. 8: Try out the first Weekend Challenge. Dec. 10: Participate in the new Best Holiday, Blast Sunday. 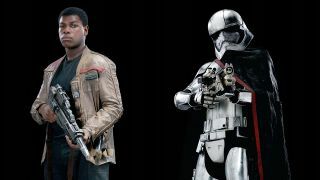 Dec. 13: Finn and Captain Phasma are added to the game. A Galactic Assault map on Crait is unlocked. A Starfighter Assault map over D'Qar is unlocked. Tallie Lintra's A-Wing is added as a hero ship and Poe's X-Wing gets a new ability. Star Wars Battlefront 2 Resurrection single-player chapter is added. Dec. 15: A new Weekend Challenge goes live. Dec. 17: Participate in the second-best holiday, Galactic Assault Sunday. Dec. 20: Try another new Weekly Faction Challenge. How about some more Daily Challenges? Dec. 22: It is Weekend Challenge time. Dec. 24: Starfighter Assault Sunday. Also Christmas Eve if you're into that kind of thing. Dec. 27: The final new Weekly Faction Challenge (of December, anyway). A special Holiday Playlist from DICE goes live. Dec 29: End 2017 right with one more Weekend Challenge.